There’s no better teacher in surfing than experience. However, it doesn’t hurt to ask for a little help from the experts especially if you’re just starting out. Smartphones are extremely popular today due to the majority of handsets being able to carry out many different jobs. They can easily connect to the web and download apps for people who need guidance on certain areas, read the weather forecast, or instructions on doing a particular activity. Gaming Realms, host to a variety of software for online gaming consumption, asserts that about 50% of mobile use is outside of gaming, which means the other half of it is used for doing things like research. If you want to do your own research on how to surf properly or hone your skills further, here are three apps that you may want to give a go. iSurfer is a good starting app for anyone. It has everything a person needs to know about surfing from safety to executing the most complex techniques. It has a program that tracks user performance so people will know how far they are in their surfing education, so to speak. iSurfer makes the transition from a complete beginner to wave veteran smoothly and effectively. APS to Go is a sports program that helps surfers get improve. It has high-definition videos of surfing tutorials and competitions uploaded by the Association of Surfing Professionals that users can review. If you want to know what professional surfers are doing, or where you can watch the next major competition, this is an app for you. 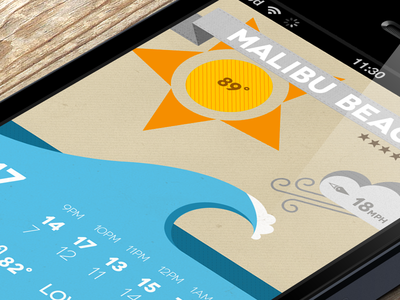 The weather condition controls surfing activities so you’ll always want to stay up to date with the weather. Surfline is a weather app specifically made for surfers that provides forecasts up to a week in advance for popular surfing spots across the globe. It also allows users to live stream said surfing spots to see if there are a lot of people already there, if the waves are low, or if it’s convenient to surf in a particular area. Viewing the Ocean as Never Before! The WaveClock App is your barometer for the ocean. It functions like a weather station for the waves and tides. It shows you critical ocean information at your favorite spots along the coast at a glance. The WaveClock queries real-time oceanographic databases to find this information through the smartphone app. Then displayed instantly on a natural analog display. The WaveClock hardware and app gives you an accurate view of what’s happening out there right now! The WaveClock App for iPhone, iPad, and Android Devices is available for free download on the Google Play and iTunes stores. The top half of the left circle shows the wave height for your station in feet. The bottom half shows the wave period. The right dial shows the tide and whether the tide is rising or falling. The App connects to the NOAA network for your favorite tides stations or wave buoys. You can manually select from a list provided, press the “Find Nearest” button to filter for the stations nearest you, or hit the “Map” at the bottom of the screen to select your location from the map view. You then have real-time data right at your finger tips! The App downloads to our hardware several times an hour giving you the very latest data too. The WaveClock components are assembled in Pleasure Point, Santa Cruz. Download this QUICK AND EASY surf trip check list. Packing for your trip is stressful enough. This check list will HELP YOU remember the important things and remove the guess work. Designed by Derek after thousands of surf trips, here are his top three: 1) Ding repair kit - 2) Condoms - 3) Pepto Bismo. We never eat or dish out spam. Derek Dodds is founder of the world's first ecological surf company Wave Tribe, surfboard shaper, world traveler, author and Mini Simmons enthusiast. You'll love our monthly newsletter.